Update: Tomas Tranströmer, nobel laureate. Tomas Tranströmer was born in 1931 in Sweden. 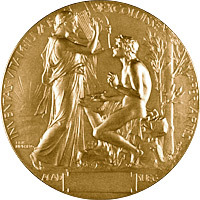 The Nobel Prize in Literature went to Maria Vargas Llosa in 2010, and other Nobel laureates include Günter Grass, Pablo Neruda, John Steinbeck and the very first Nobel laureate 110 years ago, Sully Prudhomme, in 1901. The committee will announce the Nobel Prize in Literature at 1 pm CET and it will be streamed on Nobel.se’s website. A lot of people are betting on popular names such as Murakami (Japan) and Bob Dylan (USA), and of course there are the recurring names Adonis (Syria) and Tranströmer (Sweden). Who do you think will be this years winner?